It is an inactivated, purified and lyophilized preparation of Pitman Moore strain of rabies virus. The virus is produced on VERO cell culture and inactivated by ß-propiolactone. 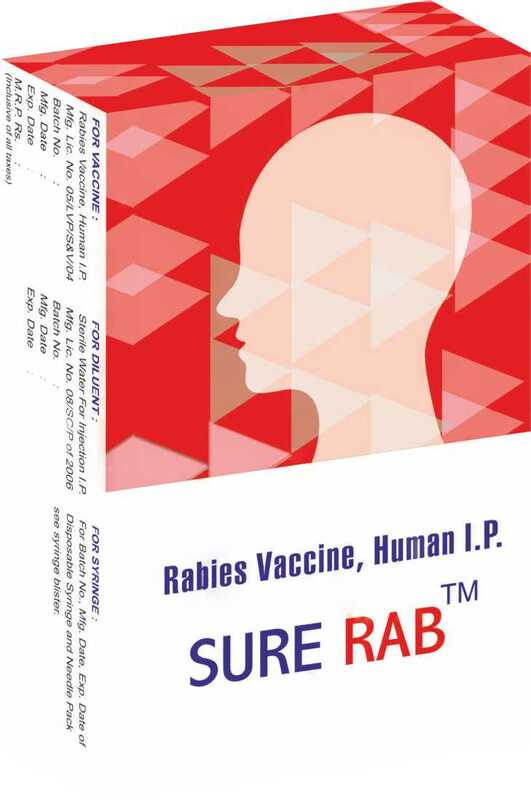 Sure Rab™ is manufactured as per Indian Pharmacopoeia. The manufacturing facilities meets the requirement as per cGMP guidelines of revised schedule ‘M’ of the Drugs & Cosmetics Act, Government of India. Post-exposure immunization – Given the fatal outcome of the declared rabies infection, there are no contraindication to post exposure vaccination. Pre-exposure – Allergic (Hyper sensitive) to any of the vaccine component, in case of disease or febrile illness it is preferable to postpone vaccination. No case of harm attributable to use of Rabies Vaccine during pregnancy have been observed to-date in mothers or children. It is not known whether Rabies Vaccine passes into breast milk. No risk to the breast- feeding infant has been described to-date. It is advisable to carefully weigh expected benefits against potential risks prior to pre- exposure immunization during pregnancy and breast-feeding. The vaccine should be shaken gently and visually inspected for any foreign particulate matter and/or variation of physical aspect prior to administration. In the event of either of the above being observed, discard the vaccine. As with other vaccines, in rare cases anaphylactic shock may occur in susceptible individual. The mainstay in the treatment of severe anaphylaxis is the prompt use of adrenaline, which can be life saving. It should be used at the first suspicion of anaphylaxis. The vaccines should remain under observation for not less than 30 minutes for possibility of occurrence of rapid allergic reactions. Hydrocortisone & antihistamines should also be available in addition to supportive measures such as oxygen inhalation. Store between 2oC to 8oC (in the refrigerator). The shelf life of Product is 36 months from the date of manufacture if stored at recommended storage conditions. The corticosteroids and immunosuppressive treatment may lead to vaccination failure. Single dose vial with appropriate diluent ,disposable syringe and needle. Reconstitute the lyophilised vaccine, immediately prior to use with entire content of the vaccine diluent provided with the vaccine, gently agitate until lyophilisate is dissolved completely. Use aseptic technique to with draw the dose. In case of unforeseen delay, keep reconstituted Vaccine at 2º to 8ºC. Reconstituted vaccine shall not be used after 6-8 hours of reconstitution. Dose for adult and infant/child is same. Current W.H.O. guidelines may be consulted for Rabies Vaccination/immunization. Day 0 indicates date of first injection. The vaccine is recommended for high risk professionals e.g. hunters, veterinarians, animal keeper/handler, butcher, rabies laboratory personnel, army professional, postmen, municipal workers, forest workers, subjects staying or visiting in rabies endemic areas or at a continuous risk of exposure. A serological test is recommended (every 6 months) in subjects at risk of continuous exposure. For subject at frequent risk WHO recommends antibody titer estimation annually. If titers are below protective threshold of 0.5 IU/ml, one booster dose should be administered. A booster injection should be administered after one year of first primary Pre-exposure immunization and subsequent booster every five years. Pre-exposure immunization consists of a series of three intramuscular injections of 1 ml each (in deltoid muscle or in the anterolateral region of the thigh in small children) on day 0, 7, 21 or 28. A few days variation is not important. It should not be given by intragluteal injection. Pre-exposure immunization consists of a series of three intradermal injections of 0.1 ml each (side of the deltoid) on day 0, 7, 21 or 28. A few days variation is not important. Vaccine when given intradermally should raise a visible and palpable bleb in the skin and shall only be done where trained personnel is available e.g. hospitals / Rabies vaccination clinics. In the event that the dose is inadvertently given subcutaneously or intra-muscularly or in the event of spillage, a new dose should be given intradermally in nearby site. As with all vaccines, SURE RABTM may not protect 100% of people vaccinated. Post-exposure immunization consists of intramuscular injections of 1 ml each (in deltoid muscle or in the anterolateral region of the thigh in small children) on day 0, 3, 7, 14, 28 & 90 (optional). It should not be given by intragluteal injection. Post -exposure immunization consists of intradermal injections of 0.1 ml each at two locations (one in each upper deltoid region, left & right) on day 0, 3, 7 & 28 (Updated Thai Red Cross Schedule 2-2-2-0-2). Vaccine when given intradermally should raise a visible and palpable bleb in the skin and shall only be done where trained personnel is available e.g. hospitals / Rabies vaccination clinics. Re-exposure following post-exposure treatment or if pre-exposure vaccination was performed (primary vaccination or booster within 5 years previously) administer two booster doses intramuscularly (1ml)/intradermally (0.1 ml at 1 site) on day 0 and day 3. Treatment with rabies immunoglobulin is not necessary. This does not apply to immunodeficient subjects. If pre or post exposure vaccination was performed more than 5 years before, if it is incomplete, in case of doubt, or in case of neural tissue vaccine used the subjects vaccination status is not considered as complete and a full post exposure treatment should be started. Pain, induration, erythema, pruritis at the injection site. Rarely anaphylactic reactions, urticaria, rash may be encountered. Pharmacovigiliance Programme of India (PvPI) has concluded relationship between anti-rabies vaccine and Erythema Multiforme.